There are no gimmicks, no ethic to evolve the genre, just a pure focus on old fashioned prog. 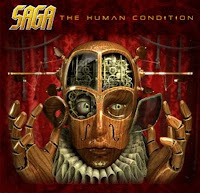 Saga’s latest “The Human Condition”, is a generic entry spanning pop, rock, metal and neo progressive influence (Marillion and IQ). Containing such idiosyncrasies it’s clear, that straight of the mark "The Human Condition" is meant to appeal to their nostalgic fans than to the neutrals brain. And whilst this really does read dull on paper, things do move fast enough for the inane amount of depth to never sink in. With vocalist and founding member “Michael Sadler” departing in late 07, “Rob Moratti” (Final Frontier) has taken responsibility of handling his vocal in the aptly but overdone symphonic power metal approach. The majority of the numbers being vocally lead is acumen to why those big shoes need filling, in the correct manner. The well executed vocal harmonies along with Moratti’s strong performance throughout the record confirm that Saga did find the right man; even if his voice is bound to the realm of clichéd – which suitably epitomises the album. Qualifying this to be a rock experience are the guitars being at the fore of the mix, with typical powerchord progressions and not so typical “Rush” played arrangements, along with the keys taking a backseat. It’s a solid, no frills approach underlining, that not much if anything has really changed since their heydays of the early 80’s. You can’t help but feel that this is for the worst, as "The Human Condition", sounds tired and ultimately showcases Saga to be an overly read story of the past. Thankfully, there are just enough memorable progressions to make the record worthwhile, even when it is incredibly stale. With old commercial watermarks, “Guns N’ Roses”, “Marillion” and “Metallica” releasing records in the past 12 months, negativity has been hurled toward them on a basis of going backward within the very genres they helped innovate. Similar feelings bubble, surrounding Saga’s latest. Is this raw expression coming from the nostalgic purist, or a regurgitated commercial cash-in? This is a fun release, that’s intended for the dedicated fan – but nobody else.